[World Hearing Day is held on March 3 each year to raise awareness on how to prevent deafness and hearing loss. It is a day to raise awareness about hearing loss across the world. The annual World Hearing Day seminar is held each year at the World Health Organization (WHO)’s headquarters in Geneva. In recent years, an increasing number of Member States and partner agencies have joined World Hearing Day by hosting a range of activities and events in their countries. Each year, WHO chooses a theme for World Hearing Day! This year, WHO will draw attention to the importance of early identification and intervention for hearing loss. Many people live with unidentified hearing loss, often failing to realize that they are missing out on certain sounds and words. As the prevalence rates rise, the global cost of unaddressed hearing loss has been estimated at $750 billion per year. Often people live with compromised hearing for seven to ten years before they take the steps to getting your hearing checked. Checking one’s hearing would be the first step towards addressing the issue. World Hearing Day is a reminder that hearing loss is a major public health issue around the globe. Highlighted today is the significant human and economic cost of untreated hearing loss and the need to act now – for the future. This year’s campaign highlights that everyone deserves to hear what the world has to offer. The campaign encourages everyone to reach out today to people they know who might be struggling to hear. Several studies have documented the impact of untreated hearing loss. A nationwide survey of nearly 4,000 adults with hearing loss and their significant others showed significantly higher rates of depression, anxiety, and other psychosocial disorders in individuals with hearing loss who were not wearing hearing aids. This survey looked at the positive benefits of amplification and showed that hearing aid use positively affected quality of life for both the hearing aid wearer and his or her significant other. Studies say that hearing loss can cause also cause lack of earning power at work and even may be linked to dementia. When people lose hearing, they tend to start withdrawing from conversations and relationships with others. They may be embarrassed they can’t follow conversations so they often avoid them – even at work! Hearing loss has been linked with cognitive decline, brain tissue loss, depression, dementia, and an increased risk for falling. The older you are, the harder it is to recover from the effects of hearing loss. 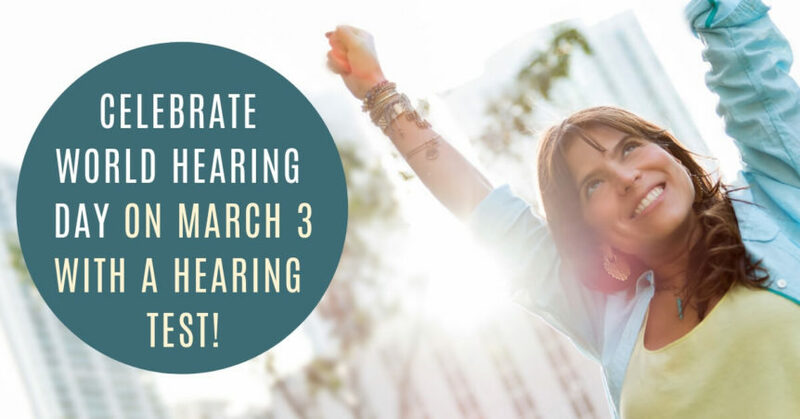 When it comes to hearing loss, knowledge is power!If your hearing test results come back normal, you can move forward with the confidence of knowing you have good hearing health. If you get tested and hearing loss is discovered, you can benefit from avoiding all of the potential health and personal issues mentioned previously. Identifying hearing loss and early treatment can change your life for the better on so many levels. In honor of World Hearing Day, contact us at Neighborhood Hearing Aid Center to get your hearing checked!